TRUSSVILLE — Charter Spectrum Internet services appeared to go down in various locations in Trussville on Tuesday at approximately 3:15 p.m. The outages appear to be impacting phone, cable and Internet services that rely on the web for transmission. 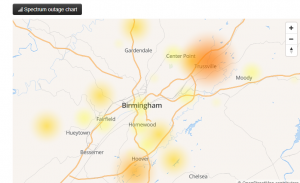 Social media comments indicate that the outage is widespread and is impacting customers in Pinson and Clay as well as Trussville. Representatives from Charter Spectrum confirmed that there is an outage. Representatives also said that the nature of the issue has been identified will be resolved, however, they could not state how long it will take until service is restored.